After my long compositional silence this was the first ensemble piece to emerge. Material from the first of my Sappho Songs provided the brittle and cold colours of the opening and closing sections. The idea was that of the "awaiting of the dance of spring" - perhaps Pluto imagining the return of Persephone. 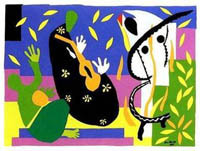 The late paper-cut by Matisse La Tristesse du Roi provided another stimulous. Its focus on "the decorative" (arabesque being something of a personal fixation already) and its rounded shapes suggested a dance. Thus, after the austere, frigid opening the piece gradually warms through several sections to culminate in an ecstatic dance. This is brutally curtailed by fff low piano chords, and the aftermath returns to the desolation of the opening, ending in a briefest ghostly frisson in the still air. The work has been performed three times: by members of the Lahti Symphony Orchestra in Lahti, Finland in 2007, and as a webcast by the ACM Ensemble. The latter group, now called the Palomar Ensemble, repeated the work in a concert in Chicago in Dec 2008.